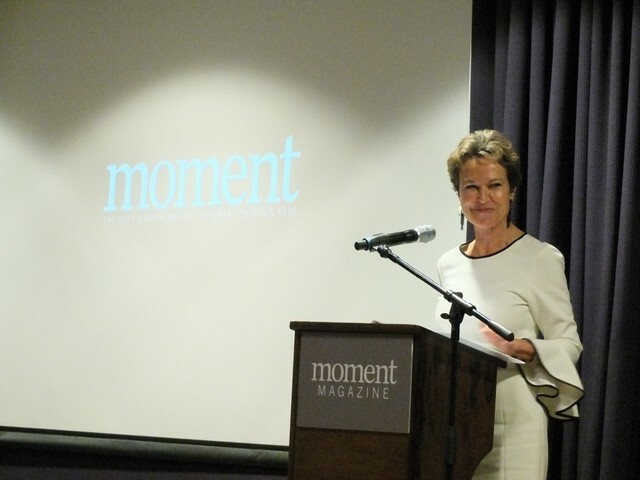 At Moment‘s 2016 benefit gala, journalist Kati Marton spoke about her memories of Elie Wiesel, who died in July. A transcript of her remarks is below. Elie was not a stranger to any human frailty. What had he not seen during his long night in that cauldron of cruelty? Nor did it bother him that I was ignorant of his faith and its rich culture and history—now suddenly my inheritance. “You are a good person,” he said, and that seemed sufficient for us to be friends—for three decades. He shook his head. “Un escroc,” he said simply. A crook, in French. Again the small shrug as if to say, Jews have crooks, too. There was something paradoxical to me about a deeply observant Jew who was at the same time very much a man of the world. But that did not mean he forgave or rationalized cruelty or inhumanity—whoever its victims. Cambodians, Bosnian Muslims, Tibetans, Syrians—he spoke up for all of them until the last. Nor was he surprised that the world had once again turned demented and glacial (his words). Nor that again we find sound reasons to stay on the sidelines while inhumanity unfolds before our eyes in real time in Syria. I loved Elie Wiesel’s handsome, lined, infinitely sad face. It was the face of Central Europe, my father’s face. When he smiled, the sun seemed to peek though the clouds for just one minute. To say that we shall not see his like again is to state the obvious. Far more meaningful would be if we could say of the atrocities Elie witnessed as a child—we shall not see their like ever again. If only we could. How beautiful and true. Your piece on Elie reminds me how I met him – through Richard. Seems hard to believe he left us too early over 6 years ago. Hope you and your family have a good holiday. Bonnie send her best.